Home Old Samsung SPH-D600 Heading to Sprint with a Ticker Screen? 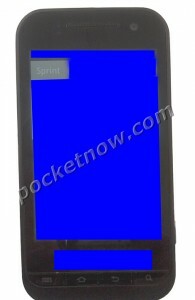 Samsung SPH-D600 Heading to Sprint with a Ticker Screen? Another smart phone has been spotted hanging out at the FCC hoping to pick up its papers on the way to the Now Network. A Samsung SDH-D600 was recently found online with a few preliminary hardware specs to share. Look for the low-end to mid-range handset to feature a 3.1-megapixel camera, and a 320×480 display as well as support for Bluetooth, Wi-Fi, GPS, and WiMAX. Pocketnow is also reporting a 1GHz processor and a sliding QWERTY form factor akin to the Epic 4G. This makes sense because the Epic 4G was the D700 while this D600 may come in slightly less powerful. Oh, and do we notice another “ticker” phone coming from Samsung? Verizon offers a pair of Galaxy S phones in the Fascinate and Continuum so it would be logical that Sprint follows a similar pattern, except with a QWERTY keyboard.